Sony wanted to be more present with their Extra Bass products to their young target group, both online and offline globally. To promote their Extra Bass product line, Sony partnered up with Spinnin’ for a big campaign to present the products as the perfect tool to listen to Electronic Dance Music. Amsterdam Dance Event was the perfect time to reach thousands of people who are part of Sony’s young target group. Amsterdam Dance Event is the biggest global gathering in Dance Music, attracting 395.000 visitors from over 90 countries, and the place to be for brands that want to be active and relevant for the Dance Music target group. As the biggest dance label in the world, Spinnin’ Records is present during ADE on multiple locations hosting various events, including the Spinnin’ Popup Store, Club Spinnin’ and the Spinnin’ Academy. During ADE, Sony was present at all Spinnin’ activities and they were also integrated in the communication afterwards. At Club Spinnin’ and the Spinnin’ Popup Store, Sony was present with their Extra Bass products and through fun games the fans were able to win some of those products. This resulted in thousands of people in their young target group to engage with the product line and through a huge social campaign and aftermovies on YouTube over 4,4 million social impressions and almost 200,000 YouTube views were accumulated. Spinnin’ partnered up with Sony as part of the campaign for their Extra Bass product line. Sony wanted to reach a young audience globally and was looking for a relevant partner in the music industry to help with the promotion. Spinnin’ integrated Sony in all of their activities during Amsterdam Dance Event. During ADE, Sony was present at all Spinnin’ activities and they were also integrated in the communication afterwards. The Sony logo was included on all communication of Club Spinnin’. Club Spinnin’ was a series of three club nights and a day program at AIR Amsterdam. The promotion of Club Spinnin’ was done through a poster campaign in Amsterdam and by using all of the Spinnin’ social media channels. To boost ticket sales for Club Spinnin’ there was an incentive: if you bought your tickets before the 2nd of October you had a chance at winning a Meet & Greet + Spinnin’ Merchandise. On top of that a contest was held where you could win a trip to Amsterdam Dance Event, including flights, accommodation and Club Spinnin’ tickets for two. In both of these campaigns Sony was integrated, the contest pages generated a total of 7,950 impressions. During ADE, Sony placed a speaker wall and photo booth at Club Spinnin’. 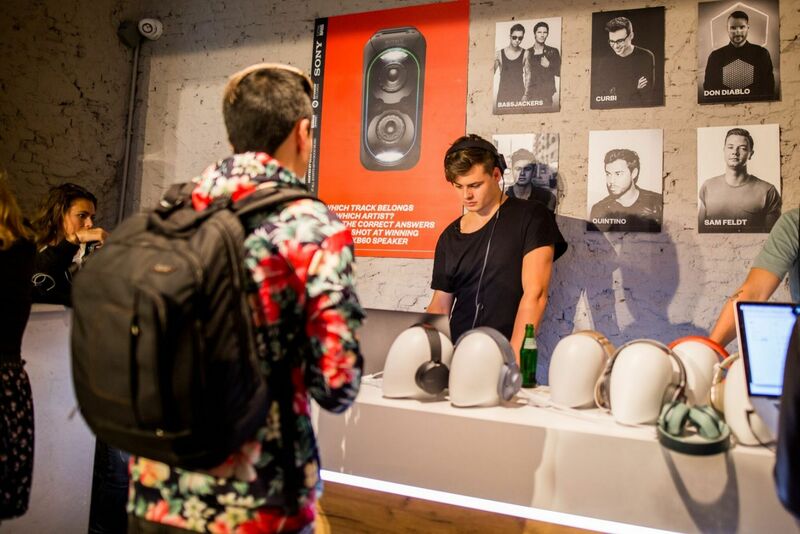 Next to that, at the Spinnin’ Popup Store fans could win Sony Extra Bass products with a “Guess the Artist” competition. You were able to listen to three tracks at the Sony Extra Bass desk and if you guessed all three artists right you had a chance to win Sony Extra Bass products. This way Sony was present with its products to thousands of ADE visitors at multiple locations in Amsterdam. To boost Sony’s presence online even more four after movies were created showcasing the different Spinnin’ events during ADE and in all after-movies Sony products were integrated plus the Sony logo was shown on the end card. The online campaign was a big success, accumulating over 4,4 million social media impressions and almost 200,000 YouTube views.